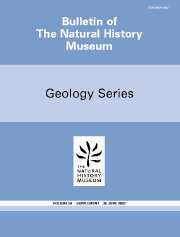 The Bulletin of the Natural History Museum, formerly the Bulletin of the British Museum (Natural History) - instituted in 1949, is issued in four scientific series Botany, Entomology, Geology (incorporating Mineralogy) and Zoology. Papers in the Bulletins are primarily the results of research carried out on the unique and ever-growing collections of the Museum, both by its scientific staff and by specialists from elsewhere who make use of the Museum's resources. Many of the papers are works of reference that will remain indispensable for years to come. All papers submitted for publication are subjected to external peer review before acceptance. The Geology Series is edited in the Museum's Department of Palaeontology.